The first place many eaters think of when they’re making restaurant reservations in the UK is Heston Blumenthal’s The Fat Duck in Bray, and I was no exception. The Fat Duck is one of the world’s best restaurants and serves a fun and experimental menu that showcases Blumenthal’s creativity alongside his culinary expertise. And this is the guy who used a hot tub as a waterbath to sous vide a whole pig…why wouldn’t we want to eat there? Cost was definitely a factor, especially at £160 (approx. $260) per person and the US Dollar being so weak, and we didn’t want to spend a huge chunk of our eating budget at one restaurant. Plus, we weren’t too keen on traveling all the way out to Bray from London just for dinner when we already had other day trips to Oxford and Warwick on our schedule. The focus at Dinner isn’t a multi-course, avant-garde tasting extravaganza but simply the modernization of classic British dishes, and on the menu, every dish has a date next to it signifying the approximate year it originated. I was glad to see this because I wanted to believe that British cuisine had been maligned by cliché stereotypes, and I was confident that Blumenthal could dispel these aspersions. 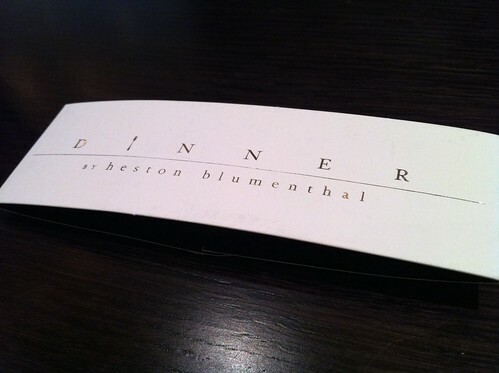 Two of Dinner’s most talked/written/blogged-about dishes are on the starter menu. 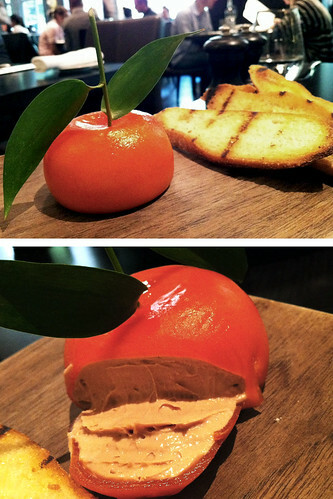 The Meat Fruit looks like a mandarin orange, stem and all, but when you cut the mandarin gel “skin,” a creamy chicken liver parfait is revealed. Spread the parfait on toast and you’re in business, and don’t forget to include a little bit of the mandarin skin for a subtle citrusy note. 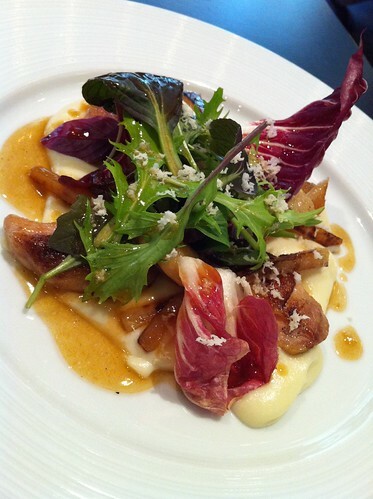 The Salamagundy is made up primarily of chicken oysters, bone marrow and horseradish cream. The original dish was what passed for a salad back in the day, and the name generally means a hodgepodge of disparate items. In this case, these disparate ingredients make a tasty appetizer. My wife ordered the Cod in Cider, a relatively modern dish compared to the rest of the menu. 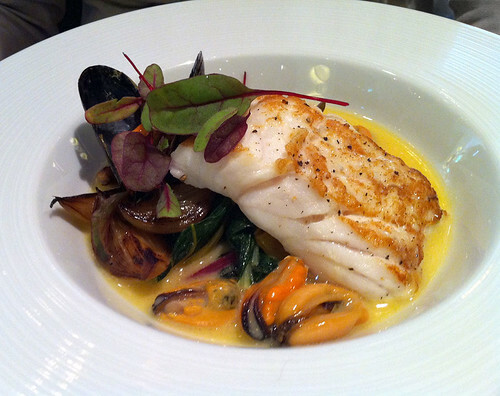 She said it was “the best-cooked fish I’ve had since Le Bernardin” (approx. three years ago) and liked the way the acidity of the cider complemented the cod. 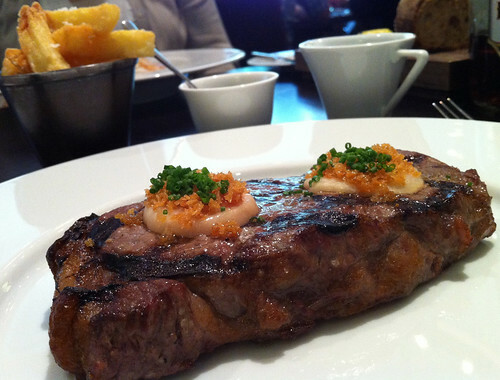 I ordered the Sirloin of Black Angus with mushroom ketchup, red wine juice, and triple-cooked chips. The steak was outstanding on its own, but the dollops of bone marrow topped with bread crumbs and chives on top of the steak took it to another level. The chips were some of the best fries I’ve ever had. 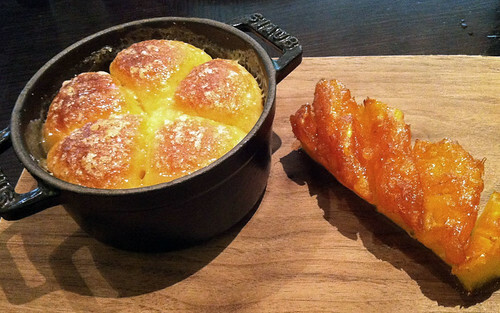 Dinner’s desserts are also getting a lot of buzz, especially the Tipsy Cake, which is basically brioche infused with creme and served in a cast iron cocotte alongside a piece of spit-roasted pineapple. If you’ve ever had grilled pineapple, I think spit roasting is much better because it’s a slower process that produces a deeper caramelized flavor. 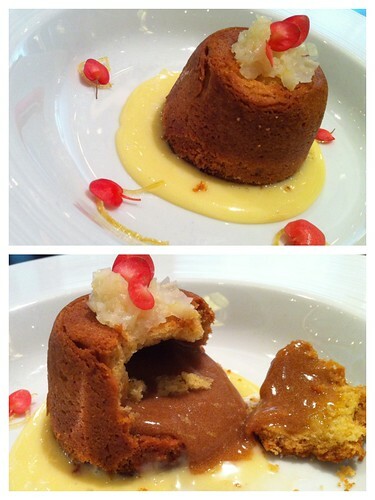 We also had the Baked Lemon Suet Pudding, which is a suet cake filled with lemon caramel pudding. I love lemon desserts, so this one was also a favorite. Service was casual and generally attentive, but they kinda forgot about me when I wanted tea at the end of the meal. I ended up just asking for coffee and the check. One really cool thing was that when we had to pay, we had the option of paying in US Dollars, which gave us the best exchange rate and eliminated at least one credit card foreign transaction fee. I assume this is because the restaurant is in a big international hotel; we didn’t get this option at any other place during our trip. Definitely looks like I need to stop here on my next visit to London. I’ve heard much about this place and most of it has been good. I really want to try the meat fruit and the desserts. That fruit meat looks crazy! And is the suet in the Lemon dessert beef suet? Or is there another meaning for suet? yeah…suet is usually beef or mutton. In the original dish, suet pastry is filled with lemon, butter, and sugar, and while it’s cooking, the sauce gets created inside the pastry. What a great post ! Was in London last month & agree with you on the GB pound amounting to more than the dollar made it tough to decide where to eat. But we found some great places. However this review is ultimately the best ! Will make sure to try and check it out next time in the UK. Thanks for sharing! I’m glad to hear you guys were able to enjoy a nice vacation to Boston and London. It sounds like you guys were able to dine at some very good restaurants. Thanks for taking the time to share your experience with us.